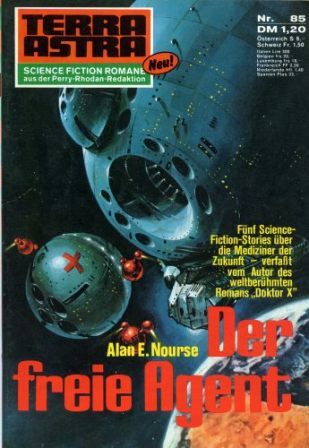 First German edition and printing ("Neu!" is stated on the cover and Deutsche Erstveröffentlichung on p. 5). Second part of ''RX for Tomorrow''. Translated by Dr. Eva Sander. No publication date given, only "März 1973" in the copyright section. This digest was published simultaneously with Perry Rhodan #605 and Atlan #78. Attention: the page count begins with the cover and the publication has no ISBN, since it was not available in regular book shops. 'Terra Astra report' is on pp. 3 & 4 and features a preview for upcoming publications. The cover art is not credited but has the artist's initials "EJ". Other prices: S 9.00 (Austria), Fr 1.50 (Switzerland), Lire 300 (Italy), frs 20.00 (Belgium), frs 18.00 (Luxemburg), FF 2.20 (France), hfl 1.40 (Netherlands), Pts 33.00 (Spain).